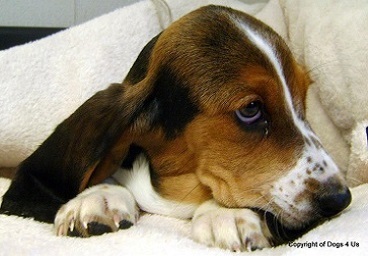 Basset Hound puppies famously possess a frown which sometimes makes them look sad. But don’t be fooled by appearances. Bassets are a cheerful, good-natured breed, ensuring their popularity in the UK among pet owners. 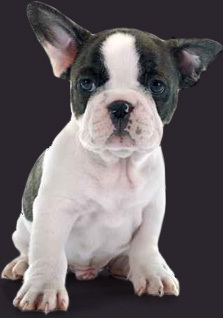 Basset Hounds usually have short coats and come in two colours at Dogs4Us: black, white and tan; and lemon and white. 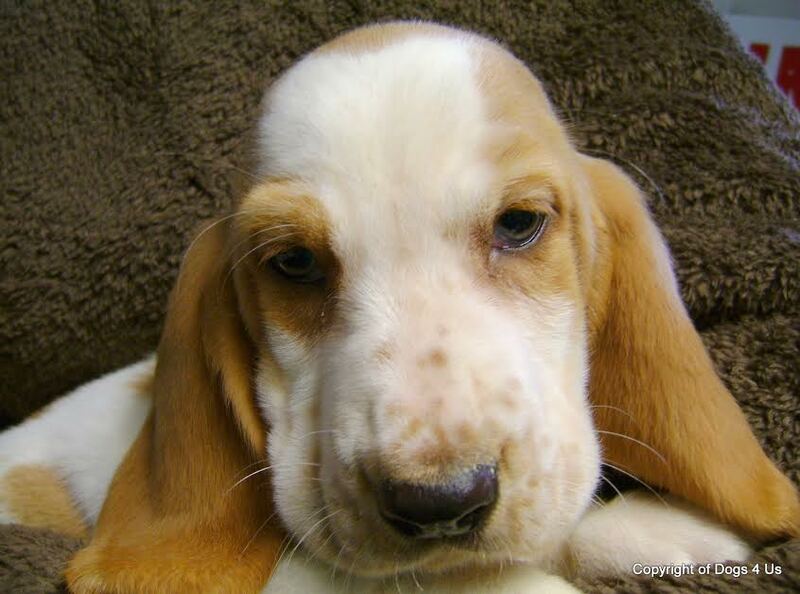 On average, a basset hound puppy will grow to 11”-15” and weigh between 40 and 60 pounds. They are home-lovers, so won’t suffer stress living in an apartment but will, like most puppies, expect to be exercised a few times each day. Apart from the frown caused by sagging skin on the face, Basset Hound puppies are characterised by long, floppy ears, sturdy necks, stout legs and being a vocal breed. Basset puppies make great family pets due to their good-nature. However, care should be shown when introducing other pets, such as cats and rabbits, as the breed hasn’t entirely forgotten its hunting instincts. 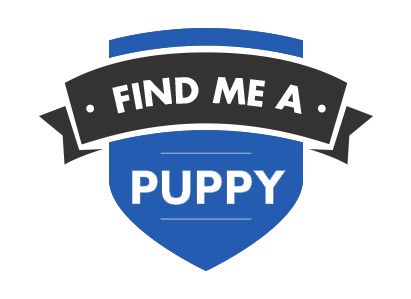 All Dogs4Us Basset Hound puppies come with a 6 month guarantee and are temporary vaccinated, wormed and microchipped for identification. Please call us prior to visiting should you be interested in buying a Basset, so we can check availability. 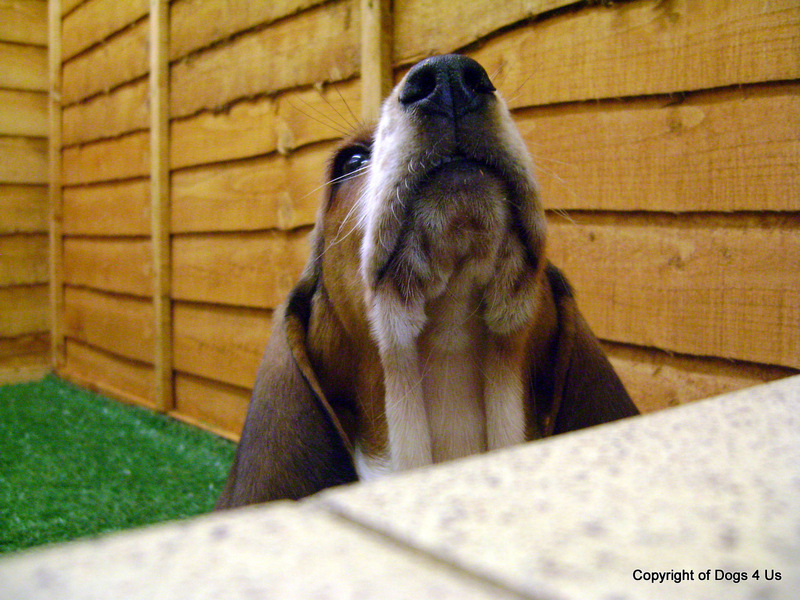 To find out more about Basset Hound puppies and to check availability contact us at Dogs4Us. Take a look at some of the Dogs4Us Basset Hound in their forever homes and don't forget to upload your Dogs4Us Basset Hound snaps to join our family galleries.